I made a recent trip to the local humane society. I saw many loving dogs and cats. What took my interest most was of a dog of unusual coloring who simply stared outside of her cage. She wasnt begging for attention nor barking like the other dogs. She appeared to have dignity and was resigned to what ever the fates brought her. Little did I or she know, we were fated to be together. It was 4 days before I took her home. I planned on her being a birthday gift for John. Of course I did not tell him that right away just in case he did not care for her. I should not have worried on that account. A week later we took her to the vet. My first trip to the local vet informed me of her suspected breed. I was surprised as it was a breed I had never heard of. She is light positive for heartworm, so needs to be on heartguard monthly for the next year before we will know if she is cured our not. She also needs to take a daily asprin. This also helps with the disease process. I knew all of this prior to adopting her. I felt she deserved a chance at having a good home. We certainly deserved a chance at having a beautiful and loving companion around the house. Although we do not have any history of our specific dog. Our Vet believes she is a Cattahoula Leopard Dog .We have named her KORI. Whether she is full blooded I do not know it hardly matters to us as she is spade and our pet. I have read many great web site which tell more information about this breed of dog. A web search gives lots of informaton. Maybe someday I will be lucky enough to get another dog, in which case I would look for a purebred who is registered. Kori doesnt really bark, she makes more of a low woof sound. She is attentive to her surroundings. Very gentle of mouth,, and fast as heck when running around. I might add she is very agile also. She is 3 years old and makes a wonderful pet. I have been reading up on her breed and love what I read about them. .The Louisiana Catahoula Leopard Dog, commonly referred to as a Catahoula, is one of the truly most versatile dogs in the United States today. There is not a feat that this dog will not make an attempt to accomplish. Widely known for its ability to herd cattle and hunt hogs (wild boar), the Catahoula has been used in every aspect of work, hunt, and show that can be imagined, including Guard Dogs, Agility, Search and Rescue and Detector Dogs. 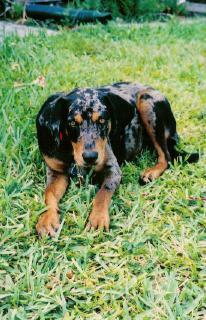 The Catahoula is a medium sized dog with a muscular build. The Catahoula female should stand approximately 21-23 inches at the withers, with males standing approximately 23-25 inches at the withers. The average weight of the Catahoula female is 55-65 lbs., while males average 65-75 lbs. This smooth coated dog with its webbed feet is capable of working in any terrain. Having evolved from the swamps of Louisiana, the Catahoula is at home in soft, marshy areas but adapts well to rough and rocky ones. The Catahoula can adapt to a wide variety of environments. 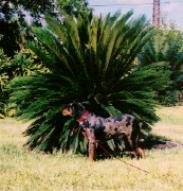 In the short course of seven days, the Catahoula can adapt from warm/hot temperatures to a cold/frigid climate. Care should be taken in making any environmental changes, and the dog should be monitored for any signs of stress. 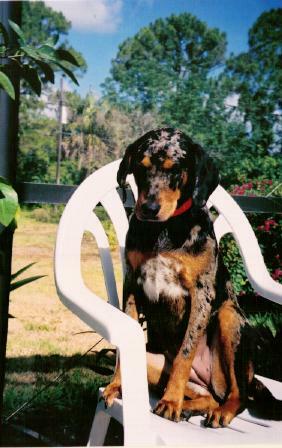 Catahoulas are very loving and loyal, but are very protective of whom and what they think they own. Once a Catahoula has grown into a family, it's hard to tell whether the family owns the Catahoula or the Catahoula owns the family. When a child and Catahoula grow together, you'll never have to worry about that child. The Catahoula becomes a natural baby-sitter, and no harm shall come to that child without the Catahoula making an attempt to prevent it. The Catahoula is a natural guardian of its property and ever vigilant. 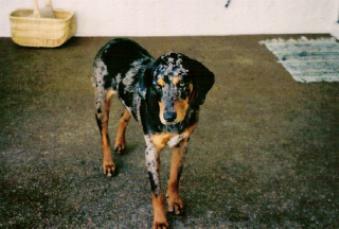 No one can approach the home where a Catahoula lives without the occupants' knowing someone is there that doesn't belong. I like to refer to them as alarm dogs, because the Catahoula will sound off a barking alarm to tell of a stranger's presence. Information taken off web site of Abney Catahoulas. Kori, looking so sad or is it hopeful? Kori has many toys already. She especially loves to carry about a sheep skin fur object I made for her. She doesnt much care for swimming in the pool. She does however gaze into it frequently as if she is considering going in on her own.